A couple of years ago, I was following the Euromaidan Revolution protests in Kiev that ultimately resulted in the bloody ouster of the corrupt president of Ukraine, Viktor Yanukovych. This thuggish man had been elected with the help of political consultants who had softened his image and put nice words in his mouth. His main American consultant was Paul Manafort, who apparently not only became a close adviser to the thief-president, but also reaped huge rewards for his work. 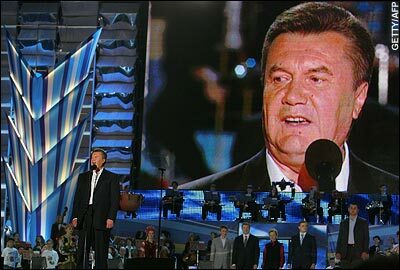 Hoping to retain the premiership, Mr Yanukovych has begun a campaign to convince Ukrainians that his time in office has taught him the virtues of democracy and media freedom. Sacking his Russian consultants, he hired Paul Manafort, an American spin doctor who had advised Bob Dole during the 1996 race for the White House, to burnish his image. Under Mr Manafort's tutelage, the once avowedly pro-Russian prime minister has undoubtedly changed. He has ditched the bouffant hairstyle favoured by Soviet apparatchiks, taken to playing tennis with the US ambassador, begun speaking in Ukrainian rather than Russian and has even pledged to take his country into the European Union. Even his past has been spun. Twice convicted as a teenager for armed robbery and grievous bodily harm, the old Yanukovych had the KGB expunge his criminal record and refused to discuss it in public. The February 2014 battles on Maidan and elsewhere left 82 people dead and 1,100 injured. After Yanukovych fled to Russia (the Ukrainian Parliament voted 328 - 0 to impeach him), Manafort could not be found for comment. He faded from public view. As far as I know, he has never publicly discussed his work in Ukraine, much less apologized for his role in helping to elect Yanukovych. 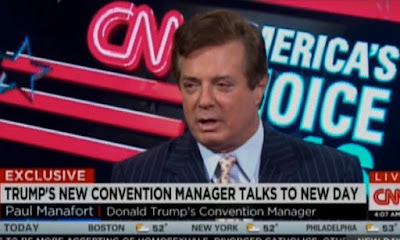 Now Manafort is back in the spotlight. The Trump presidential campaign recently hired him to manage its efforts to round up delegates and maintain their loyalty at the Republican National Convention. A few days after his hiring, Manafort has become quite visible as a spokesperson for Trump. He recently told an interviewer that "I work directly for the boss," meaning he does not report to Trump campaign director, Cory Lewandowski, Only yesterday (April 10, 2016), he was on Meet the Press accusing the Cruz campaign on "Gestapo Tactics" to secure delegates. While Manafort apparently is a talented political consultant -- at least he has earned millions from people willing to pay him for his advice, his moral compass seems to have quit working decades ago. Nevertheless, he is still welcome to work on the highest level of politics. Apparently there is no shame attached to helping to elect corrupt authoritarians, and no penalties come from helping to rip apart the fabric of a sovereign nation. I guess no one should be surprised that the Trump Campaign would find Manafort's work in Ukraine to be of no concern. So what if he helped elect a thug whose cynical corruption was startling even for Ukraine? What is surprising is the lack of attention paid in newspaper stories to his disreputable past. The New York Times article announcing Manafort's appointment to manage "delegate corralling" mentioned only that he was a "seasoned operative" and "veteran Republican strategist." Apparently his work in helping undermine democracy in Ukraine was unimportant. Even worse, an April 7 article in the Washington Post, presented his work in heroic terms with the headline: "From Ukraine to Trump Tower, Paul Manafort unafraid to take on controversial job." For this reporter, Manafort's work in Ukraine was just another job that ended badly. It seems that many (most?) in the press view the presidential campaign as a big game of moves and counter moves The hiring of Manafort was viewed as a astute move because of his experience, many years ago, as a delegate manager for Gerald Ford, and his reputation as a political consultant. When such game is being played, who has time to pay attention to such minor short comings as his work helping a thieving thug get elected president of another country? In my view, every newspaper story that mentions Manafort without stating his role in helping undermine democracy in Ukraine is incomplete, and the reporter should be ashamed to have his name on it.